Kersey is often described as Suffolk's prettiest village, although it might be more accurate to say that it is the county's quaintest. It sits in one of the crumpled valleys where the landscape corrugates to the north of Hadleigh, and while this village can become irritatingly overrun with tourists in summer (although nowhere as bad as when Lovejoy was on television) it is a very atmospheric place in late winter, with a chill in the air under a heavy sky, and crows calling achingly across the bleak fields. You get the impression of continuity, and that it may be a working village after all. St Mary stands aloof from it all above the village street at the top of the hill. Beside it sits Suffolk's smallest school, and to the south the surviving evidence of a 19th century tree collector. The view northwards from it is tremendous, across the Brett valley. The tower is that of a good Suffolk cloth church, a little sister to nearby Lavenham. Because it is so grand, it makes the north aisle and nave appear rather small, which in fact they are, for take away the Victorian chancel and this is not a big church. The north door faces the village, but the main entrance into the church is through the flushwork of the south porch, one of Suffolk's best, as at Boxford, where the grand south porch is also on the 'wrong' side of the church. The carvings in the spandrels are curious - one appears to show a tree with two fish, the other an entwined foliage crown. Why build such a fine structure on the south rather than the north? Perhaps it was because there already was a good north porch when the late medieval donor chose to contribute a grand new one. But Simon Cotton suggests another theory. Perhaps it was intended, not for villagers, but for visitors to the shrine of Our Lady of Kersey. A Papal Bull of 1464 takes up the story: To all Christ's faithful etc, Pius II, having learned that to the parish church of St Mary Kersey (called de Pietate) in the diocese of Norwich, there was a great resort of the faithful on account of the infinite miracles which, by the merits and intercessions of the same Virgin, had been and were being wrought daily by Almighty God at a certain image of her in the said church, granted in perpetuity, under date Id March Anno 6 to all who, being truly penitent and having confessed, visited on the feasts of the Annunciation and Nativity of the said Virgin, from the first to the second vespers and give alms for the enlargement and restoration of the said church, an indulgence of three years and three quarantines of enjoined penance, the said grant to be null and void if any similar and unexpired indulgence had been granted by the said pope. If the niche inside on the north wall contained the image, then the south porch would have provided maximum impact on entry. You step into a well-ordered, well-kept, well-fed church. Because of its location, this church receives a large number of visitors, but in fact it is not an easy church to read. There is a complexity to its developing and reordering, and much that has been preserved is no longer in situ. Broadly speaking, the interior can be divided into three parts. The nave is slender and high, a development of an earlier space at the opening of the 15th century. The wide north aisle dates from half a century earlier, a splendid Decorated space before the Black Death made us all serious. The two together make a light, square space bisected by a high, lovely arcade. 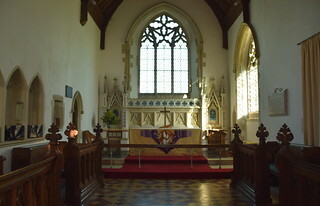 The chancel is all 19th century. What happened here? On the eve of the Black Death, a major reconstruction was begun. The north aisle was almost completed, work on the tower commenced. Then the horror of the mid-14th century intervened, and work stopped. Mortlock says that the location of the tower shows that a south aisle was also planned. It was never to be built, and before the mid-16th century Reformation finally brought all work to a stop the tower was completed and a porch built directly onto the south side of the nave. The imperative for this work being completed is explained by the shrine described by Simon Cotton above, there could be no waiting around for the money for another aisle. And then, the Reformation happened, and it all came to an end. The north aisle remains the most interesting part of the building. There are extensive remains of wall painting, although there are almost no discernible figures or features. About halfway along the north wall is a large angel; he appears to be carrying an upside down pair of pincers, in which case it might be part of a sequence of instruments of the passion, or perhaps it is the top pivot of a balance, in which case he is St Michael. There is another remnant of wall painting in the nave, which Cautley identified in the 1930s as St George, although this would be rather hard to say certainly now. Above the arcade, you can see how the rood loft stretched across aisle and chancel arch, with a doorway between the two. The great niche mentioned above now contains salvaged images, including part of a large alabaster trinity group, the crucified Christ being held by the Father. They are displayed behind perspex, making photography rather difficult. At the east end of the aisle, two great niches flank the altar with rescued statuary. To the left is a mutilated St Anne. On the floor here is what is claimed to be a recovered early font, but it looks rather more like a holy water stoup. Fixed to the wall here are panels from the rood screen. Now, it is possible that all this medieval curiosae did not come from this church originally, simply because it would be so easy for a 19th century collector to have installed them here. Be that as it may, these six panels are very splendid, including one of Suffolk's best 15th Century images of St Edmund, and there are two more kings and three Old Testament prophets. perhaps this building is more a reflection of 19th century Anglican triumphalism than it is of its Catholic past, and the historical evidence, the rood screen, ancient font, carvings and statues, are all preserved somewhat in the manner of a museum, that is to say without the liturgical integrity of, for instance, Dennington. Nevertheless, the interior is light and airy, and to its eternal credit the parish has resisted setting up one of those hideous craft shops so familiar from other Suffolk churches in tourist villages. Perhaps the most moving thing in the whole building is the set of sedilia in the north aisle, with a squint through to the now rebuilt chancel. Look at the beautiful arcading as it intersects at the top of the sedilia. The carving peters out. It was never finished. This was where the mason had got to on that morning when news of pestilence and disaster reached the Brett Valley.